One of the projects I’ve used Datazen was a project that needed operational reporting. These dashboards was to be updated at least every 10 minutes and was placed on big screens around the work area where it was needed. We also created an overview, or landing page, for super users that needed to have quick access to all dashboards without waiting for the dashboards loop on the big screens. In the beginning this landing page was just a static html site, as we didn’t want people to use the Datazen portal at that point. Every dashboard had a static thumbnail and when a user clicked on a thumbnail they were brought to the respective Datazen dashboard. This worked fine, but it required every user to go into each dashboard to have a look at the status since the thumbnail did not change. So we decided to spend some time to create a dynamic landing page, or a dashboard of dashboards that showed real time thumbnails of the dashboards. By doing this they couldn’t necesserily see the numbers on all of the dashboards, but they would be able to see status and where things where green or red. Datazen can be embedded in web pages by the use of iframes. Doing this gave us a more dynamic page that was refreshed when a user entered the site or after a given interval if they stayed on it. What you will notice if you try this is that a click on a dashboard will not open the dashboard itself, but instead you will be able to interact with the dashboard in the iframe. In our case, this was not what we wanted as the purpose was to just see the status and when a user clicked on a dashboard they were sent to that specific dashboard to get more details and in full screen. In order to solve this we created a new <div> called clickCatcher with the same size as the Datazen “thumbnail”, and made transparent. This allowed us to display the dashboard in the size of a thumbanil, but open the dashboard when it was clicked instead of interacting with the small version. The code for one thumbnail is posted below. It’s a neat little trick that made us able to create a solution that was easier, an better, for the customer. Too see how you we auto refreshed dashboard pages you can take a look here. Yesterday I saw Christopher Finlan tweet about one way of making your Datazen dashboard auto refresh. He used a Firefox add-in for this, and I’d like to show you how I have been doing this. If you want to show Datazen on a big screen there is at this point no out-of-the-box way to auto refresh your dashboard, meaning you have to open it to get new data. If you use the browser viewer you can quite quickly create one of the simplest websites in the world to do this. It will make your page refresh every 90 seconds. 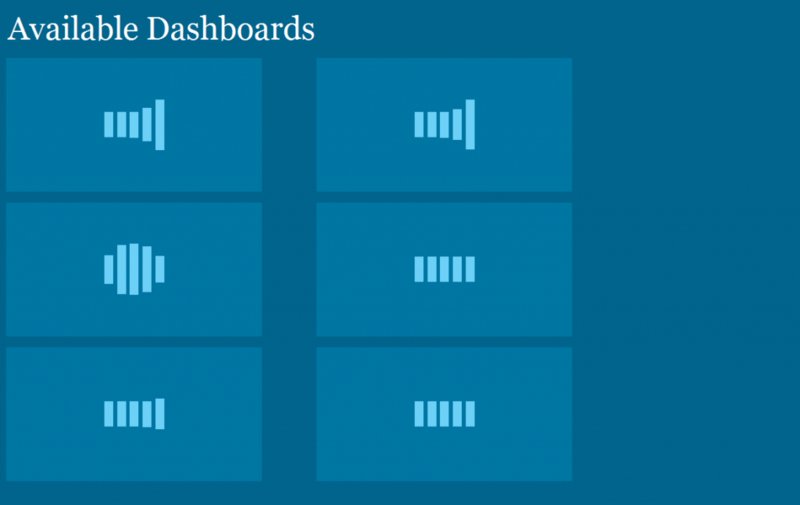 This can also be used if you want to circle some of your dashboards, sort of like a carousel. The line below will after 30 seconds go to the specified URL instead of just refreshing the page. To complete the circle make sure to go to the first dashboard in your last dashboard. Note: If you are going to setup an auto refresh I’d suggest you also set up your guest account so you can have access to those dashboards without having to login. You can then use the public dashboard URL in the source of your iframe. I’ve been using Datazen at one of my customers , and spoken about it with a bunch of other people about it, lately. People are starting to really get their eyes up for Datazen now, maybe because it’s free if you have a SQL Server Enterprise Edition license? Anyways, I’ve met some challenges the last couple of days and I want to highlight some of them. I guess this is my way of putting in a few feature request. Maybe they are already on the roadmap, maybe not. What am I trying to do? I need to compare two different zones with the same measure and compare it to another measure for each hour for the rest of the day. This comparison measure will change throughout the day and can also differ between the two zones. Great, I know what I am going to do! I’ll choose a “Comparison Time Graph”, choose my measures, choose hour as default time unit as and we should be good to go right? No! First issue is that the axis’ are data driven, which is a nice feature in general, but in this case I need them to use the same axis’ for comparison reasons so I really wish I could have fixed axis’, or be able to use a third measure to define the y-axis. In this case I ended up calculating a third measure to force the graphs to have same y-axis based on the higest value in one of them. So I am now comparing measure 1 with measure 2 AND another measure to push the y-axis. This affects the comparison values below the chart however and wil now never go above 0. If i could chose to remove that difference value that wouldn’t be a big problemas the user could just use the graph, but I am not able to that. Below I have the output from the Win8 app in the top of the image and the web browser viewer at the bottom. They clearly are showing different information. I want the hours to be displayed as in the browser viewer, but I want the tooltip from the Win8 viewer. I want to see the values of each measure, or at least have the option to do this. The browser is also only showing the label of one of the two masures I am actually comparing to. I was really excited when I saw that Microsoft had bought Datazen. I have been able to use Datazen for a while already, and I really like the product. At the Gurus of Business Intelligence conference in Oslo in 2014 I was lucky enough to be able to have a session together with Marc Reguera, @marcreguera, where I spoke about mobile and touch based reporting using Datazen as the example app. Now why do I like Datazen? First of all I think they have a clear vision, a vision I like. They want to create great data visualizations for mobile and touch based devices which are easily designed and shared with others. It is not a data discovery tool like Qlik or Tableau so you need to have your data organized in order to get the full effect. 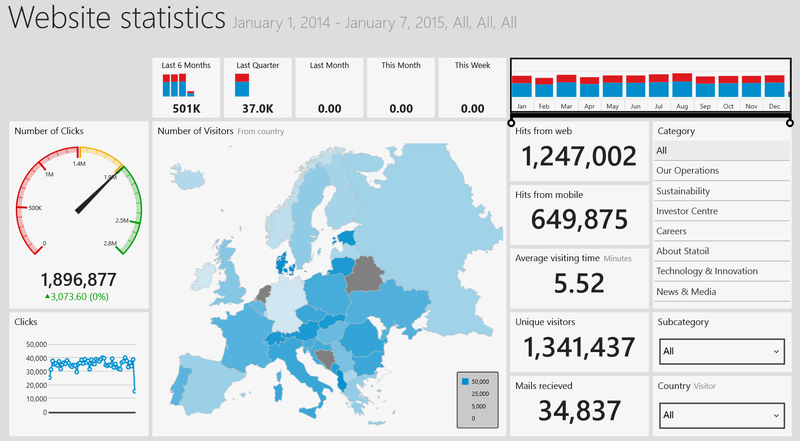 But when you are ready to create visualizations and share those with your coworkers it is really good in my opinion. You have predefined graphical elements you drag and drop onto your design surface and connect your data to. You also have the possibility to create custom maps and color palettes with backgrounds to get the right feel for your dashboards. Datazen has three major components. You need a Datazen server in order to get data from other sources than local Excel files. When you have created a dashboard you are also able to deploy your dashboard to the Datazen server so it can be consumed by others. The server also grants you access to a control panel where you can setup KPIs, set permissions, set up connections to your data sources and create data views which can then be imported into your dashboards. This brings us to the other two parts of the Datazen stack, the viewer and publisher apps. The publisher app is only available on Windows 8 devices at this point. This is where you import your data and create your dashboards before you can publish them to the server. The publisher itself is also made for touch so using f.ex a Surface to create visualizations on the go, or in a demo environment, is a real joy! 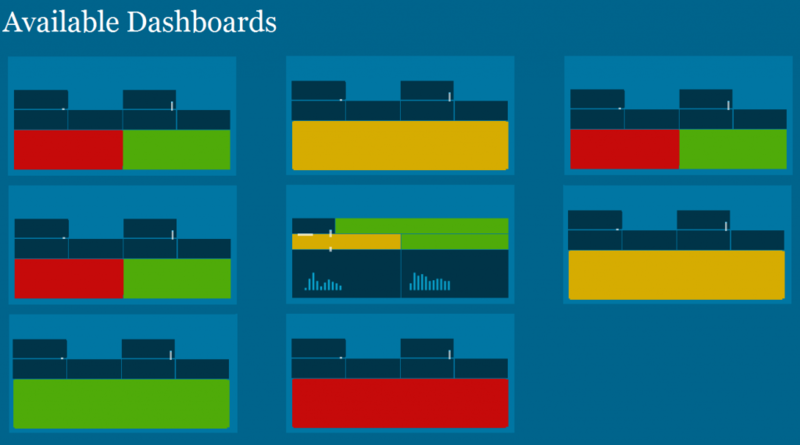 It is quite fast to setup a dashboard design and connect your data to the graphical elements you have available. In my eyes this is a really important feature because it allows you to quickly iterate over different designs. I don’t know how many times a client has come back and said “But that’s not how I visualized the report in my head”. Now you can sit with your client and quickly make a new version of the same dashboard right there and then. I have several times prepared a dashboard to present in a demo, but have found myself creating a dashboard on the go instead. Because it is easy to do so. Because I can. You can even hand over your computer to the client and let them create the dashboard during your demo! The viewer app lets you consume dashboards deployed to a Datazen server you have access and is available for all mobile platforms as a native app. If you are used to Android you will still have the Android feel unlike some apps that have been made to fit all platforms, but rarely do. 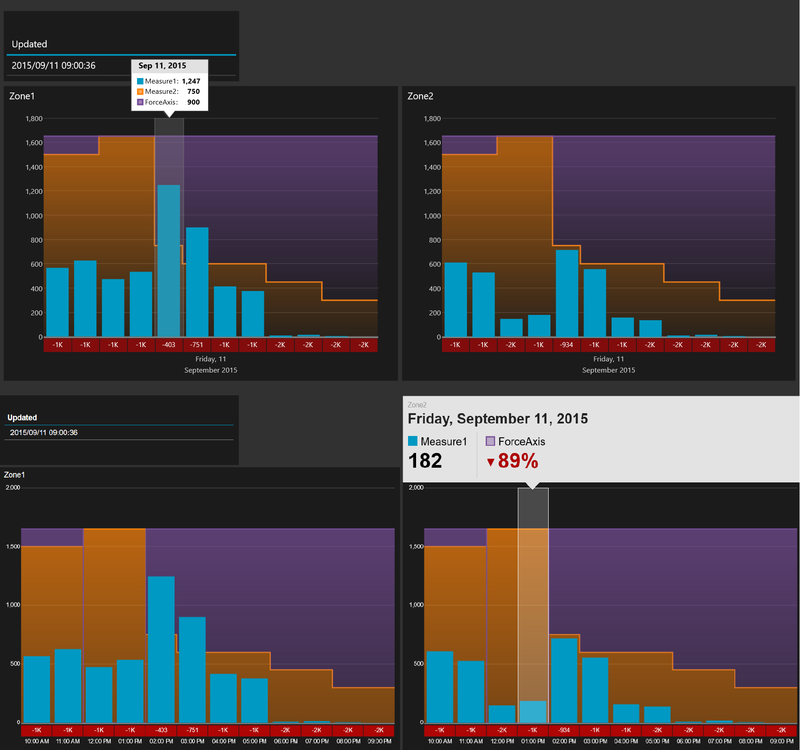 When you design a dashboard you create several versions of the same dashboard to fit different resolutions. A dashboard made for a phone may have to emphasize different things than one made for a laptop, simply because some graphical elements, like a map, is perhaps not that suited for a small screen. Datazen also gives you offline access to your dashboard which I think is absolutely essential for all apps. You can download the Datazen publisher for free from the Windows 8 store and use local Excel files to create your own stunning dashboards right away. If you want to share those dashboards or get data from your databases or other sources, you will need access to a Datazen server. When the announcement was made Microsoft also announced that SQL Server Enterprise Edition customers with version 2008 or later and Software Assurance are entitled to download the Datazen Server software at no additional cost. Give it a go. It is a really well made product, and a lot of fun to play with! The road from raw data to presenting them on a well made dashboard on someone else’s mobile phone is getting shorter! For more information go to http://www.datazen.com/.